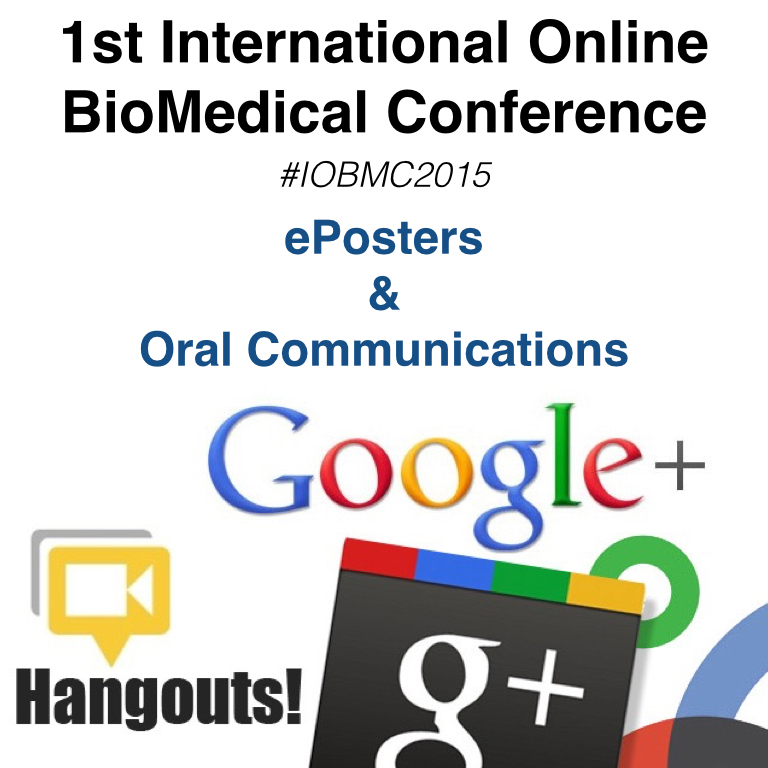 The 1st International Online BioMedical Conference (#IOBMC2015) will take place online on September 10th-13th, 2015. IOBMC is one of the most innovative conferences and it is being increasingly welcomed by doctors, biomedical researchers and biomedical students from around the globe. Medical doctors, medical students and biomedical researchers are invited to take part in the conference as attendees or as presenters. Presentations will be delivered via YouTube and Twitter. Registration is free. In both cases we expect presenters attend the meeting to present their ePosters or Oral Communications. They should share screen to show the ePoster or Slides and deliver a live talk of about 10 minutes using Hangouts on Air. Get recognition and acknowledgment. All presenters can request a certification issued by International Medical Society. All accepted abstracts will be published in Cureus. All posters will be published in Cureus (view). Authors have the option to of publishing the full-length proceedings in International Archives of Medicine and get indexed in renowned Scientific Databases (example). All participants must register before sending abstracts. In both cases, abstracts have to be submitted online and authors should present their work using Google Hangouts. Submissions should be original and unpublished papers and must have not been submitted or been under review elsewhere. Case reports are welcome. Tables and Figures should be included as supplemental files. References should be according to American Medical Association (AMA) Referencing Style. First create your poster using a presentation software or an online presentation editor as Google Slides. Save your presentation both as pdf, ppt and image files. Upload the image of your poster at IMS channel at Cureus. 2. On the left menu you´ll find a box “Submit your research”. Select “Poster” and press “Submit”. 3. You will find a form, fill it and select “First International Online Biomedical Conference” at the bottom. 4. Save and Continue > Add authors > Upload the image of your ePoster (the image must be a minimum of 1,000 pixels wide. Additionally, the file size must be no larger than 10 megabytes) > Finish the submission. It is expected one of the authors presents the poster in live session via Google Hangouts. Presenters can use just the image of the poster or a short number of slides (up to 5) for the presentation. Presenters should share their screen during live presentation. Your presentation should take about 5 minutes long. We will send you a link where you have to connect for presenting your ePoster in Google Hangouts. The moderator will be online also. First you should edit your poster or presentation using a presentation software or an online presentation editor as Google Slides. Presenters should share their screen during live presentation. Your presentation should take about 10 minutes long, then your slides presentation should be short (10-12 slides). We will send you a link where you have to connect for presenting your communication in Google Hangouts. The moderator will be online also. All abstracts will be published only as preprints in the journal Cureus (free of charges). Additionally, authors can opt-in to have the full proceedings published in the journal International Archives of Medicine (example). Opt-out. The abstract will be published in Cureus as a preprint only (not in an article as such). This option is free. Opt-in, full paper: the full proceedings of the work presented will be published in an independent article, with its own DOI, to be published in in International Archives of Medicine. This option has a cost of 150€. IOMC Conference has a PUBLISH AHEAD system, which allows the publication of Accepted Full Paper in the indexed journals upon their acceptance and even before the conference dates. Therefore, early submissions are strongly encouraged. Anyway, there is no deadline for submission of manuscripts (they can even be submitted after the event).